While Google Search Console is an indispensable SEO tool, it’s also an invaluable resource for paid search. Whether you’re in the keyword planning stage or you’re a few months into an AdWords campaign or, as in my case today, you have taken over an existing campaign and you just want to make sure nothing has been overlooked, Google Search Console is a great (and quick!) 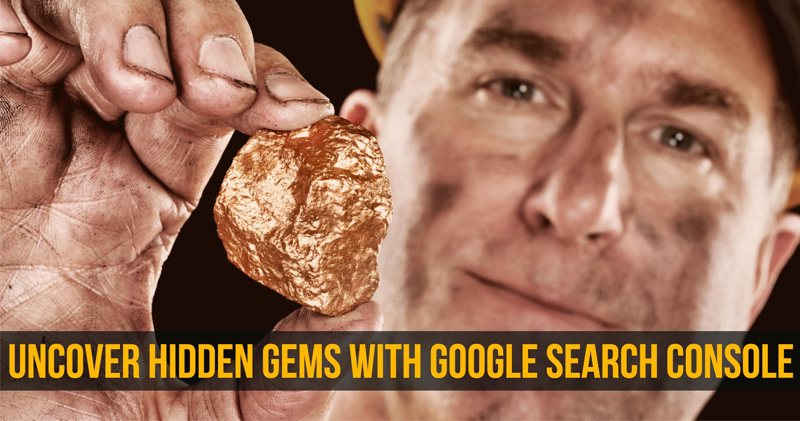 way to discover those hardworking keywords you may have missed. Google Search Console, previously called Google Webmaster Tools, is a free service provided by Google that allows you to see what keyword searches led to your site being found by the search engine. You can see the queries, your page position for those queries, the CTR (number of times someone clicked on your link relative to the number of times your site turned up in search), etc. Google Search Console is free but you or someone on your team will need to make sure that you have GSC set up correctly and that you have it properly integrated with your Google Analytics account. If you haven’t done that yet, the links at the bottom of the page will help you out. One note: you don’t have to have GSC integrated with Analytics to view, snag, and/or enjoy all this info. You could do everything we’re doing here right in GSC’s own dashboard. But since I like to take a gander at GSC info every week or so when I’m looking at Analytics, I find it much easier and more convenient just to remain in the loving arms of the Google Analytics interface. You’ll find Google Console data in Google Analytics under Acquisition. Then expand the Search Console link. After that, click Queries. You should see something resembling the picture below. You’ll notice that have a lot of valuable data already. You could simply scroll through this data and I bet you’d get quite a few ideas just by doing that. But let’s get fancy and organize our data further. You could just browse the data here, but you’ll note your sort options are limited because some key columns are not sortable. So let’s move this data to a spreadsheet. Before we do that, though, you might want to filter out all the branded queries (unless you’re tweaking one of your branded search campaigns). You could filter that in your spreadsheet, but why not just do it here. Click on the “advanced” link (above header rows, next to search field). Select EXCLUDE from the dropdown. Then SEARCH QUERY. Then MATCHING REGEXP and then enter some of your branded queries, each separated by the “|” pipe character. So “yourbrandname|brand name|brand product|commonly misspelled brand name” etc. Click apply and now at least you’ve cleaned the majority of your data. We want to bring this data into a spreadsheet. 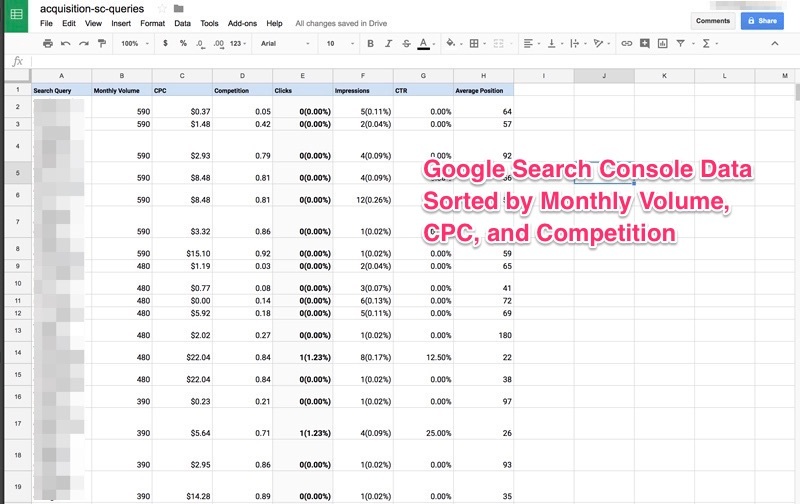 Unfortunately, Analytics won’t let us do that simply by exporting to Sheets or an excel file because we’ll be missing some key columns: notably Monthly Volume, CPC, and Competition — 3 things we’ll definitely want to use to determine what keywords will be most valuable to us. So select ALL the rows and columns (including the header rows) and copy them to your clipboard. Note that if you’re doing this directly in the GSC dashboard (not in Analytics) you’ll still run into the same export issue. You export the data only to be heartbroken to find that key columns like Competition and CPC didn’t get exported. So you would have to do a copy/paste in your browser, like we’re doing here. So at this point you can pretty much manipulate your data to your liking. It all depends what your goals are. I’m going to sort first by Monthly Volume (descending) and then by CPC (ascending) and then by Competition (ascending). Your first 50 to 100 rows will probably be way too broad to be useful. I’m just going to delete every row up until I see something that looks like it would work for me. So right out of the gate, I see plenty of keywords I already have. I see plenty of junk, too. But I also see a couple of jewels — queries with a high monthly volume, a low CPC and low Competition, a couple of which aren’t in my current campaign. So I’m grabbing those and will probably head over to ubersuggest.io or Keyword Planner to explore variants and throw those in the mix later. Also, the account I’m working on is in a super competitive environment with lots of big spenders. Because my client is a smaller player in the market, I can’t go after some of the expensive and popular keywords but, because my LVC (Lifetime Value of a Customer) is high, I wouldn’t mind seeing I can find valuable keywords with a high CPC that have lower competition. So I sort by Volume, Competition, CPC to see what could be worth testing. I see a lot of keywords that I already have but notice a few new ones that look interesting. So there you have it. Again, use Google Search Console before and during your next AdWords campaign and you may be surprised what you ALMOST overlooked.